I purchased this laptop last month, on September 3rd. A note, I wouldn’t write technical specs or other geeky stuff about this ASUS ROG GL551JM-DH71 as the official page will give you more info on this. I was looking at an ASUS laptop that I can bring anywhere I go, especially to work. For years I have used a Toshiba laptop and I am still a fan of them, because they have been efficient and affordable. Now, I want to have a device that can fit my tasks and GAMING, because I am very seldom at home, sitting in front of my desktop, playing games after working all day. If I am home, I want to either rest on my sofa or bed and play some of my games. Before I decided to go with this ASUS GL551JM, I consider Lenovo Y50 and the MSI Ghost, but I went with this laptop because MSI is about $400 more and wasn’t happy with Lenovo Y50 screen. I am glad I purchased this ASUS GL551JM. Found this beast cheaper here. One tiny complain that I want to mention it first. The Screen is a TN screen, isn’t IPS display. Now that some of standard laptops and Chromebooks have IPS displays, I expected ASUS to feature IPS on ROG model. However the screen isn’t the worst in the world. (especially when you ever used Lenovo Y50). Viewing angles are not excellent, but still decent. You get great left and right viewing angles, and decent on the “Up and Down” angles. First of all, this ASUS ROG GL551JM-DH71 is a BEAST and can exceed my expectations, all of them, as gaming and general daily use. I can run all game, including Battlefield 4 at 1080 maximum resolution and high settings with FPS ranging from 40-50+. It’s definitely built for power gamer, it has rubber black lid, and aluminum casing. The area around the keyboard, the touchpad is built from metal material. It comes with Intel Core i7-4710HQ 2.5GHz processor (Turbo to 3.5 GHz), combined with 16 GB of RAM. This laptop is a versatile gaming device. The ASUS ROG GL551JM-DH71 laptop has a single cooling, and does get hot, however it literally doesn’t fry my lap when I use it. I played low resource game like Warframe for half an hour, monitored the temperature, and it was under 80°C. It does get warm, but won’t kill your laptop. The laptop itself will shut down if it gets on max heat. ASUS ROG GL551JM-DH71 red illuminated keys. The backlit keyboard is beautiful, it’s red illuminated light, you can use your FN + F4 key to adjust the backlighting. It will be automatically off if the laptop isn’t in use for period of time. Compared with MSI Ghost, this ASUS GL551JM has better trackpad. It’s a plus to have a portable computer and trackpad is nice, also the sensitivity level is adjustable. You have enough ports on this ASUS GL551JM-DH71, tons of ports that are convenient to use. On the right side, you will have 2x USB 2.0 ports, an ethernet port, 1x HDMI 1.4 port, and a mini DisplayPort 1.2. I also have to mention, the HDMI 1.4 port can support 4K video resolution. In the right side, you will have 1x USB 3.0 port, CD/DVD tray, and headphone outlet. More info on the heat. With the latest generation of Intel Core i7-4710HQ, 16GB of RAM, 1TB 7200RPM HDD, and GTX 860M nVidia GPU, and a large 15.6″ inch matte screen, this laptop is a power gamer’s dream. No regret. 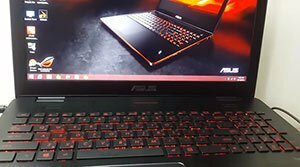 ← Previous: Is Asus X551MAV-RCLN06 15.6″ Notebook PC Worth It?